Theater in the Now: Blazing Saddles the Musical a Reality? Blazing Saddles the Musical a Reality? According to the man himself, "Blazing Saddles" may actually get the musical treatment. 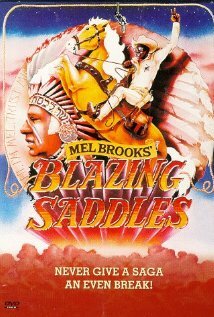 At a PBS panel, Mel Brooks stated that he's seriously thinking about turning the western comedy into a Broadway musical. He said, "A lot of it is musical already. It has a rather fanciful and fantastic tone to it. and now that "Django Unchained" has literally used the N word, I think I’m in the clear. I don’t look so bad. He really used that word a lot." If it does happen, will it be The Producers hit or Young Frankenstein flop? Are you excited for another Mel Brooks musical? Start casting!